I used to have a pet magpie. I must have been about nine or ten years of age when I was playing with friends in a paddock across the road from the Lansdowne golf course and we were attacked by a magpie protecting her young in the nest. She swooped down on us and inflicted superficial wounds to our faces and hands. My callous response was to steal one of her chicks and take it home and feed it warm milk from an eye dropper and some of Long’s Meatmarket’s best beef mince. The bird thrived and became a much loved member of the family. Maggie would sit on my shoulder as I rode around town on my bike and would nibble my ear affectionately. I was a sort of a modern day Long John Silver, but without a wooden leg it was really only the bird and the Long that fitted the comparison. DOC and the regional councils consider magpies to be pests. This is mainly because of their propensity to attack people (which of course, I can verify), but there is also strong evidence that they also destroy native birds. Wherever the magpies have been eradicated, the native species return and thrive. Rooks are also described as pest animals; their unacceptable behaviour mainly revolves around destroying crops. 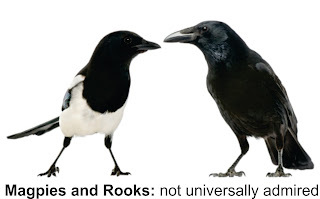 It got me to thinking that perhaps the settlers who colonised Aotearoa from the early 1800’s were a bit like the magpies (an all-white version) and the rooks. They came to this country and almost caused the total eradication of the natives. Despite the fact they often tended to nibble the ears of some of the more nubile of the Maori maidens by 1900 there were only 40,000 of the indigenees left in New Zealand. The human version of the magpies and rooks had swooped on their lands and destroyed their crops. Inevitably the descendants of the colonists started to realise the errors of their ancestors ways and agreed to negotiate with the original inhabitants to see how that could put some of the wrongs to rights. The Maoris have rebuilt their stocks to around 600,000 people, although as a result of ear nibbling many are now tainted with the blood of the European interlopers. Recently the government announced that the Kahungunu people of the Wairarapa and Tararua were to be given $93 million in cash, the return of 23,000 hectares of land and significant cultural redress in settlement of the tribe’s historic grievances. Then in a surprise move the Masterton District councillor’s agreed to appoint two unelected Maori representatives to sit around their table. Many saw this as a step too far, perhaps thinking that Ben Couch, Georgina Beyer, Jim Rimene and Edwin and Owen Perry had all achieved representation via the ballot box. But the council is unrepentant. I must say I did feel a tad guilty about stealing a baby magpie from its mothers nest. But time wounds all heels.